Primavera P6 lets users create schedules with relationships between activities across multiple projects. While useful for working on schedules that require such relationships, occassionally these relationships can create issues, particularly if working in copies of projects that may contain relationships to other projects when these are not actually required. Identifying where these exist between projects is not exactly easy within P6 itself. This article will show a method using P6 Admin Reports to list these relationships in opened projects, and as the report is stored within the database, it can be applied across any set of projects in the same database. When in the P6 Projects view Check that the projects to be inspected for inter-project relationships are all opened. 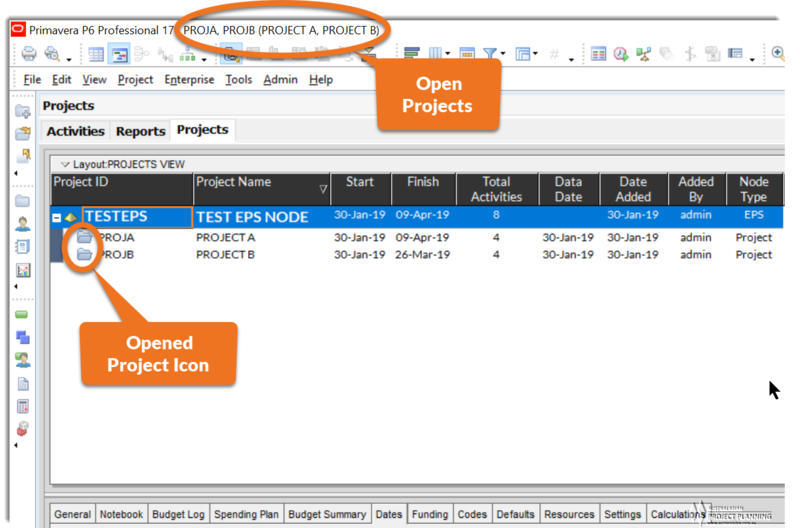 The top bar of the P6 window lists the currently opened projects. It is possible to inspect relationships in the Activity view and show the predecessor and successor project ID for inter-project relationships in the relationships tab of the lower section activity details. However, this method is best if the specific relationship is already known, and would be time consuming to determine all such relationships if they were unknown. The best method to identify all inter-project relationships is to generate a listing of all such relationships. Unfortunately, Primavera P6 does not make this easy. 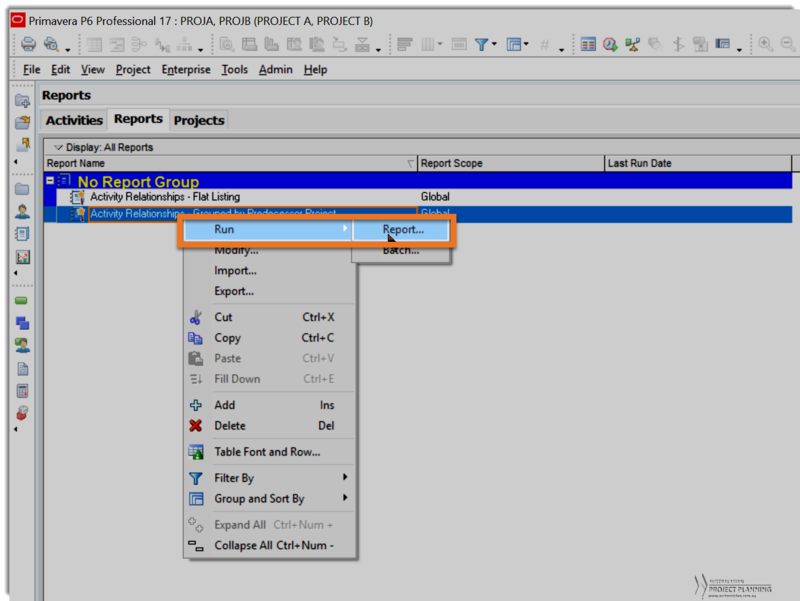 Generating an XLS Export of Activity Relationships does not list inter-project relationships (only those within the same project), even if mutiple projects are opened and exported. However, using the P6 Admin Reports feature of P6, it is possible to generate lists of all relationships including those between projects. 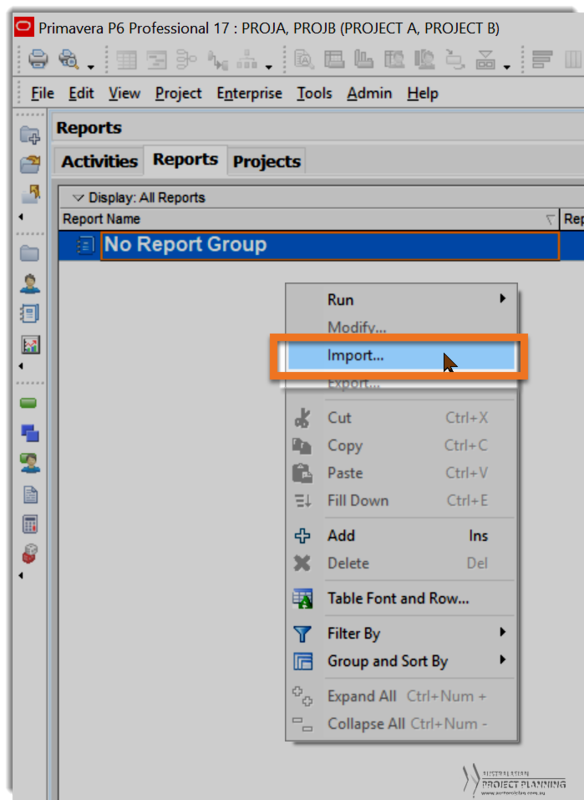 The following steps of this article show step-by-step how to import such a report to generate these lists, either as printed reports, or as data lists for analysis in spreadsheets. 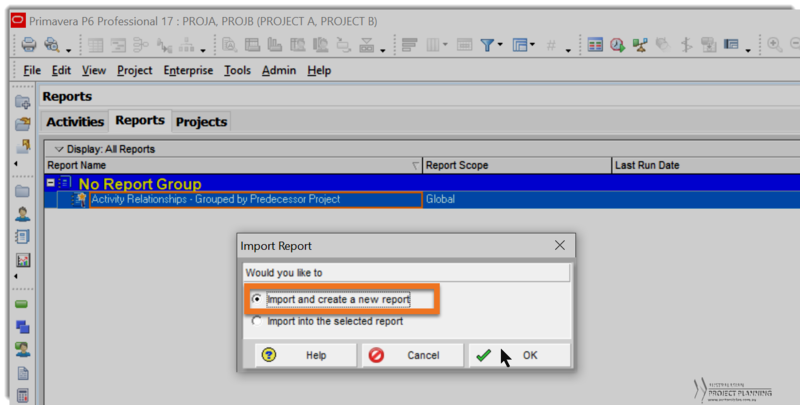 We’ve provided the required report in a zip file that can be imported into Primavera P6. Note that these reports were generated in P6 release 17.12, but should be compatible with most other releases of P6. 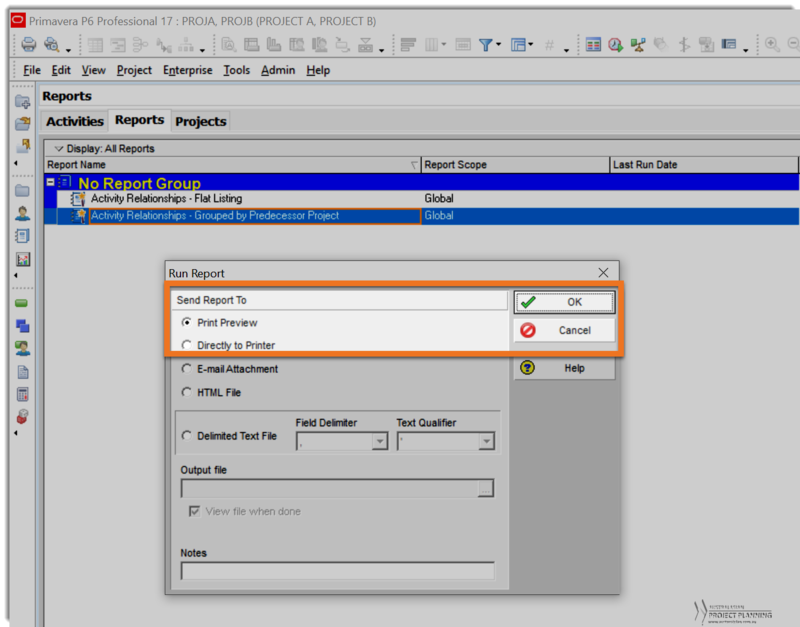 A Primavera P6 ERP Report file for producing a grouped report of relationships. 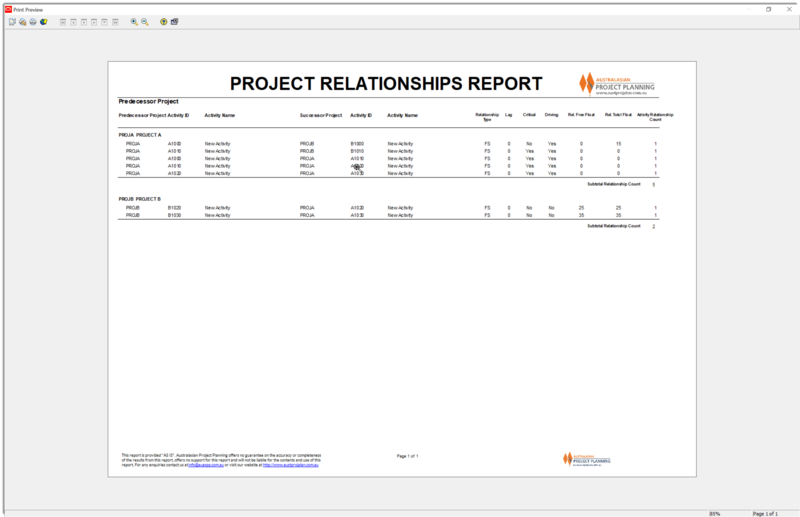 A Primavera P6 ERP Report file for producing a flat listing of relationships. An example delimited CSV file output from the “Activity Relationships – Flat Listing” report that can be opened as a spreadsheet file. This step requires users with the security privileges to create/import P6 reports. 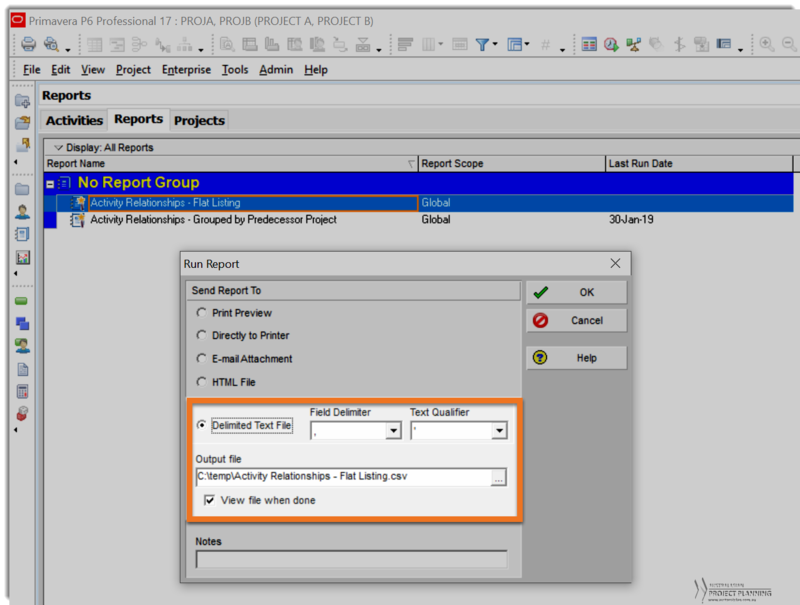 Navigate to the P6 Reports View, TOOLS>REPORTS>REPORTS to find a listing of all the existing reports. The previous method produces a report of all relationships, and for large project schedules, this may produce an extensive listing of relationshps that makes identifying inter-project relationships difficult. Therefore a list of all relationships that can be filtered to show relationships between projects may be preferable. 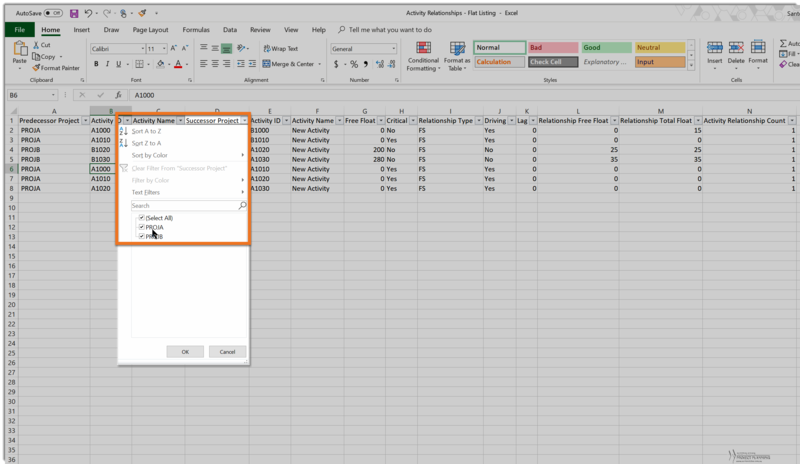 Using spreadsheet features to filter the columns, select the predecessor Project ID to filter the project desired project, and then use additional filters to filter for Projects other than the predecessor to determine the inter-project relationships.